Branding is one of the most important aspects of any business, large or small, business-to-business or retail. Yet it is one of the least appreciated and understood aspects in SME’s. An effective brand gives you a major edge in increasingly competitive markets, and separates you from your competitors. Simply put, your brand is your promise to your customers; it is the ethos of your business. It tells them what they can expect from your products and services, and it differentiates your offering from the competitors’. The brand is derived from who the Company is; who it wants to be and who people perceive it to be. A fundamental part of your brand is your logo and strapline. It is important that these truly reflect the nature of your business, products and services as well as the ethos of your company. 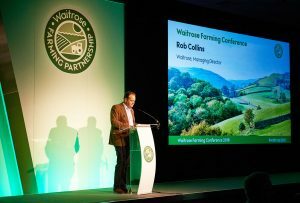 Brand created by the Core team for the Waitrose Farming Partnership. Not having a professionally designed, high-quality, visual identity can cost you money. A logo that is not aligned with your vision, values and target audience can cause confusion in the market. For example, if you provide quality services with attention to detail, then a lack of attention to detail in your brand sends conflicting messages to your prospects. Branding will help you stand out from your competitors, add value to your business and engage with your customers. Creating difference – it’s a way of clearly highlighting what makes you, your products and your services different to, and more desirable than, anyone else’s. Adding value – people are generally willing to pay more for a branded product than they are for something which is unbranded. Connecting with people – creating a connection with people is important for all organisations. Your brand can embody attributes which the customers will feel drawn to. It can also create customer loyalty. Equity – a good, strong brand will add significant, real value to your business. For example, Google’s brand was valued at $109.5bn last year. At Core we know how to build brands. We have a tried and tested process, built around our experience, enriched by creative tools designed to spark new ideas. Discover – we bring inquiring minds to a project, putting your business, products and target audiences under the microscope until we find a ‘story’ that lifts your brand out of the ordinary. Design – visual appeal alone is not enough. We look at how to bring a brand vividly to life, using our vision to inspire everyone charged with building the brand. Deliver – once we’ve cracked the thinking and the design, now we make it happen – on time and on budget. We oversee every stage of production to ensure nothing is lost between the vision and implementation. Your single most important marketing tool will be your brand – don’t underestimate its power and value. brand and add real, tangible value to your business.